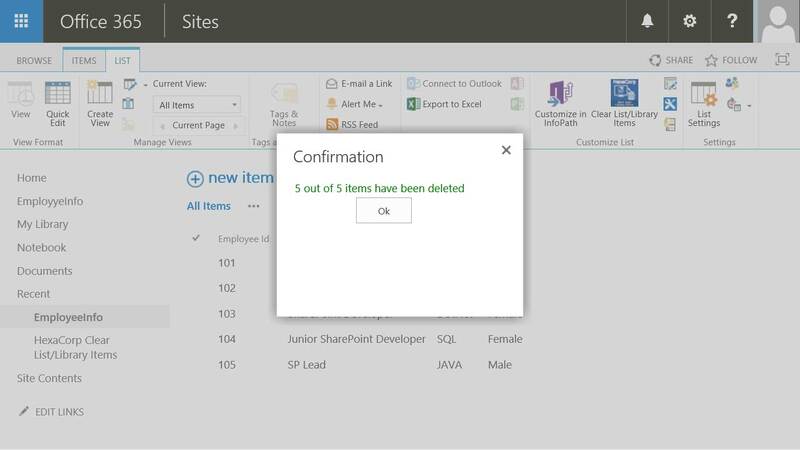 Allows users to easily delete all items from a SharePoint list or library. Provides option for a user to send deleted items to the recycle bin or permanently delete the items. Works with Custom list, Document library, Picture library and Asset library. Easily accessible from list/library ribbon. Removes folders and sub folders. Displays the number of Parent folders and Items in the List/Library. Skip checked out items and proceed with deletion. Support for all list types and libraries. 2. Click on the “Clear List/Library Items” icon which is available in the ribbon under the “LIST” tab. This is shown in the screenshot below. 3. By Default the “Delete items and send to recycle bin” option will be selected and the number of items in the list will be shown. 4. Click “OK” to send the deleted items to the recycle bin. A message will appear confirming the specified number of items have been moved to the recycle bin. 6. Check the “Delete items permanently” option. 7. Click “Ok” to completely delete the items. 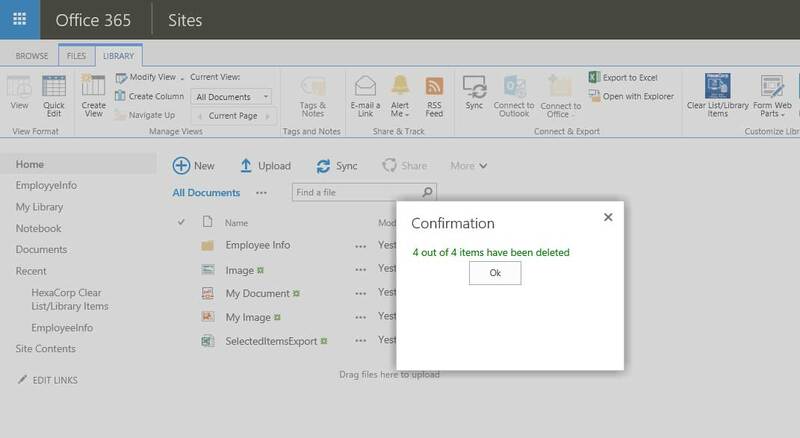 A message will appear confirming the specified number of items have been deleted. 8. Alternatively, click “Cancel” to cancel the operation. Note: If the custom list doesn’t contain any items and a user clicks on the Clear List/Library Items icon, the message below will appear. 1. Navigate to a specific library (E.g. Document Library, Picture Library and Asset Library) in the site. 2. Click on the “Clear List/Library Items” icon which is available in the ribbon under the “LIBRARY” tab. This is shown in the screenshot below. 3. 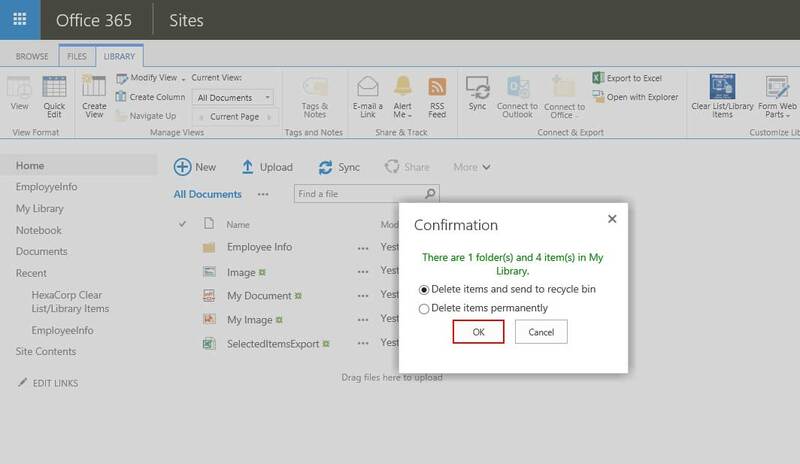 By Default the “Delete items and send to recycle bin” option will be selected and the number of folders and items in the library will be shown. 4. Click “OK” to send the deleted items and folders to the recycle bin. 7. Click “Ok” to completely delete the items. Q:1. What is the Clear List/Library Items app? The Clear List/Library Item is a SharePoint App that works with SharePoint 2013 and SharePoint Online (Office 365). You can install it from the SharePoint App store. It allows users to delete/recycle all the items in a custom list and library without selecting any item. Q:2. Does the “Clear List/Library Items” app support Libraries? Yes, it supports document library, picture library and asset library. Q:3. Does the “Clear List/Library Items” app support Checked-Out documents? No, it does not support deletion of Checked-out documents. No, it does not support Versioning settings. Q:5. What permission(s) do I need to use this app? Q:6. Does the “Copy/Move” app support Folder? 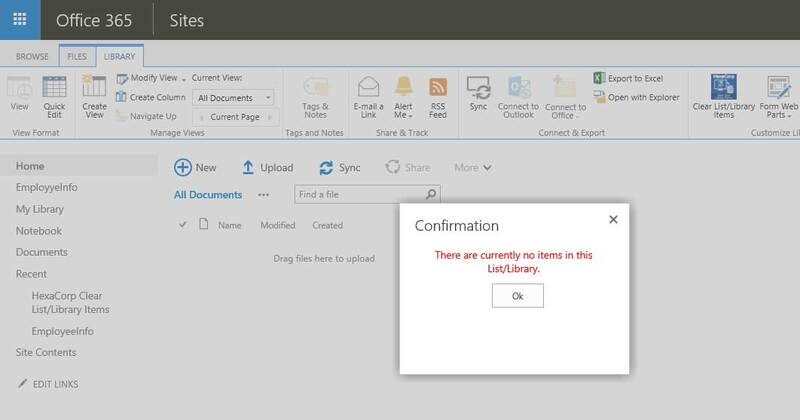 Count of sub-folders and count of items inside folders will not be displayed. The Checked-Out documents will not be supported. The Versioning settings will not be supported.